How fast did November creep up on us this year?! I can not believe it's november already, where did summer go? Love the plate and the fox. Really really like your collage ! I want to see the knitting needles for that blanket! WOW! Them is some large stitches!! I love Thanksgiving, but it is slowly being overrun by the media and stores to just get on to Christmas. Ugh. Ach wie nett, liebe Duni! Friendsgiving, davon habe ich noch nie gehört. Das finde ich eine tolle Idee. Eine wunderschöne Collage hast Du übrigens passend zum Thema für uns rausgesucht. Yes I love the idea of "Friendsgiving!!" I have been wanting to do one for years but never get around to it!!! ein wundervolles Moodboard ganz passend zum Thema. Danke ! What a gorgeous blanket! Lovely collection Duni! Hope your brother and his family gets settled quickly! I'm not really sure what we'll be doing for Thanksgiving this year. We won't be with family, but last year we celebrated with friends and hopefully we can do the same this year. Schöne Ideen & Anregungen! Danke! 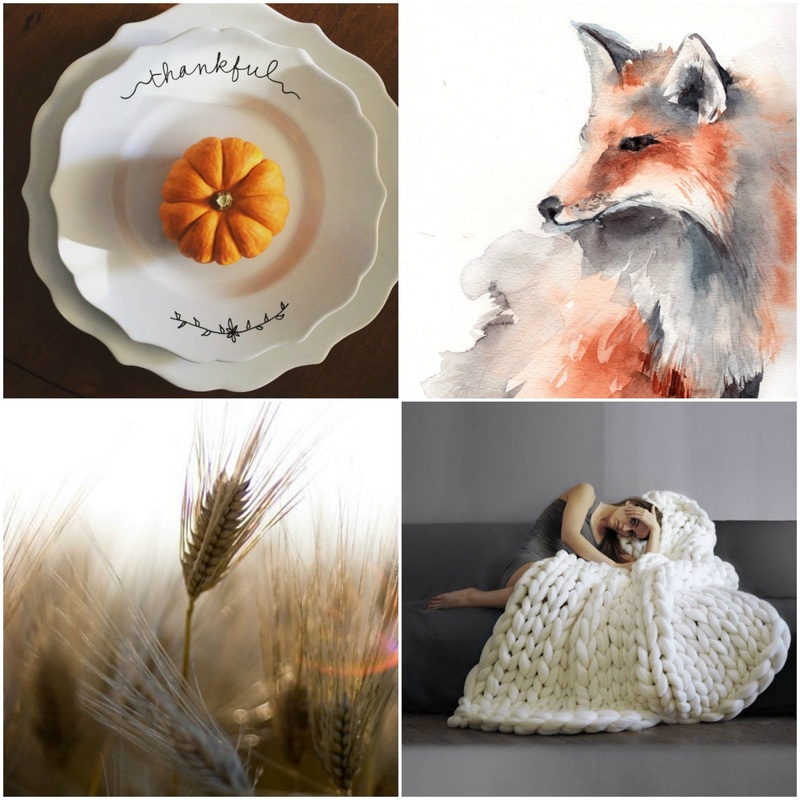 These are such perfect November images! I love the fox. I love that super chunky blanket. So cool! My mom makes a batch of stuffing outside the turkey for me. I'm the only vegetarian of the bunch but my brother prefers stuffing prepared outside of a bird so at least I don't have to feel like she is only making it for me! The veggie casseroles are my favs. My husband and I don't eat meat, but we love Thanksgiving. Meine liebe Duni! Wow, wie schön dein Moodboard wieder geworden ist! Ich hab mich ja jetzt gerade wahnsinnig in den tollen Fuchs und die Decke verliebt! So hersbtlich und gemütlich ♥ Sowas hätte ich auch gern zuhause ;D Das hast du wieder mal ganz toll zusammengestellt meine Liebe! November already, how did that happen?!? Love those plates. Simple, yet oh so pretty! I know, how did we get here already?! We attend a Thanksgiving and a Friendsgiving every year, so we don't have to worry about hosting but we always bring food. Before you know it, it will be Christmas! Yes, Thanksgiving is one of my favorite holidays. Of course, I have such a large family, that we always enjoy seeing one another and spending the day or the weekend together!